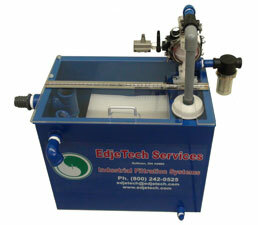 Tramp Oil Skimmer and separator | Edjean Technical Services Inc.
EdjeTech’s oil water separator system (T.O.S.S. T1) is an economical solution to eliminate tramp oil problems. The T.O.S.S. 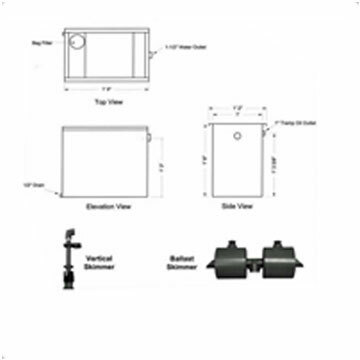 T1 is priced so that one can be put on every machine tool sump in the shop. We designed T.O.S.S. T1 to extend the life of water-soluble oils, semi-synthetic, and synthetic based coolants. It does this by removing free floating, dispersed and loosely emulsified tramp oils from machine reservoirs. Screw machines shops will find the T.O.S.S. T1 beneficial on their coolant sumps because it greatly extends the life of the parts wash water bath. How does EdjeTech's T.O.S.S. work? EdjeTech’s T.O.S.S. removes free-floating, mechanically dispersed (beaten in) oil, and suspended solids from contaminated fluid. The EdjeTech floating skimmer is mounted in the reservoir that contains the contaminated fluid (see picture on right). The floating skimmer is adjusted to skim the surface of the reservoir and pull in the free-oils that are floating on the surface. The skimmer also pulls in fluid beneath the surface that contains mechanically dispersed oil and suspended solids. The separator supply pump pulls the contaminated fluid through the skimmer and discharges it to a bag filter (see picture on right) located in the separator. The fluid filters through the bag, removing suspended solids, and flows under the tramp oil discharge trough into highly efficient coalescing media. The media is made up of one cubic foot cubes and contains 132 square feet of surface area. The large volume of surface area in a small area is what allows for 99% separation efficiency of 20 micron oil droplets and larger on the first pass. The more area the fluid has to flow through and attract to the plastic media, the more efficient the separator. The clarified fluid from the coalescing media flows into the clean fluid chamber and is discharged from the separator via an adjustable overflow weir and typicaly back into the reservoir from where it came. The free oils removed by the media surface to the top of the tank, flow into the tramp oil discharge trough where they gravity drain out of the system into a client provided holding container (i.e. 5 gallon pail, 55 gallon drum). The clean fluid flows out of the unit through the clean discharge hose that has been placed in the coolant reservoir. The T.O.S.S. T1 can be run while the machine tool is in operation and requires no attention other than bag filter changes. Model #1052 handles parts wash waters up to 200 deg. F.
"What would you say to someone in the same situation as you? I would tell them not to bother with a belt or disc skimmer and if they really wanted to get rid of their tramp oil to call you folks."